13 Dwarves Comedy Tour, poster from imdb. Bilbo Baggins, Gandalf, and 13 dwarves continue their journey to the Lonely Mountain, home of the clever and ferocious dragon Smaug. Along the way, they kill orcs, get captured by giant spiders, help elves squash spiders and kill more orcs, and discover the inhabitants of Middle Earth who happen to not be orcs. Gandalf goes off on his own adventure to uncover the dark forces awakening in Middle Earth, but doesn’t make it back in time for the fun under the mountain. The movie ends with Smaug flying off to toast things for breakfast. Ian McKellen returns as Gandalf, the wise wizard devoted to the protection of Middle Earth. His booming voice and commanding presence continue to impress. Richard Armitage (Thorin Oakenshield) and Lee Pace (Thranduil) both contribute regal performances, especially during an emotionally charged discussion king-to-king after the ruler of Mirkwood captures the company of dwarves. Pace maintains an air of danger in his portrayal of Thranduil, perfect for a king already at war against dark forces. Armitage, meanwhile, manages to bring surprising emotional depth to the role of Thorin, a determined and proud king who doesn’t quite know how to react to failure. Evangeline Lilly appears as Tauriel, a new elf character created by Peter Jackson to provide a female presence in the movie. Though Lilly’s acting is superb, the character’s firm placement in a romance plot is disappointing. Aidan Turner (Kili) and Orlando Bloom (Legolas) get special mention for being the males involved in Tauriel’s romantic drama. Bloom also features in several fighting scenes, while Turner receives the distinction of being one of the only dwarves blessed with character development, a positive side-effect of Tauriel’s romantic interest. Luke Evans is the enigmatic Bard the Bowman, resident of Lake-town, part-time smuggler, and descendant of kings. Benedict Cumberbatch, of course, provides the voice of the dragon, Smaug. He is fierce, terrifying, and perfect in his contempt for the little hobbit who invades his home. Cumberbatch’s vocal performance is, for me, one of the movie’s highlights. Finally, Martin Freeman must be mentioned as the Hobbit himself, Bilbo Baggins. Mr. Baggins stares at his new ring a lot and uses its tricks to help the dwarves escape from trouble. Most impressive, however, is his interaction with Smaug, which not only showcases Bilbo’s character development, but allows Freeman to show off his acting skills as well. 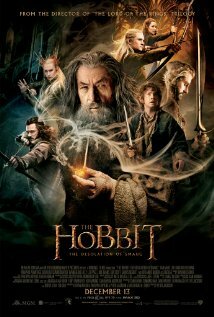 As suggested by the poster topping this post, Desolation of Smaug sees Bilbo developing at best into a side figure in the trilogy named after him. Too much focus is wasted on unnecessary and flashy action sequences, following Gandalf as he predicts the events of Lord of the Rings, and listening to dwarves panic about having to get to the Lonely Mountain by Durin’s Day. Presumably due to the overwhelming number of traveling companions, Jackson foregoes meaningful dialogue and character development between the comrades for travel montages, chase sequences, and intricate battles where the dwarves perform stand-up physical comedy sketches. Precious little of substance, save for the occasional Durin’s Day comment, comes from the dwarves or our Hobbit, until they reach Mirkwood Forest, home of elves. This is also when Gandalf conveniently goes off on his own plot to Dol Guldur, a sequence filled with Sauron screaming his presence at the audience. Between Mirkwood and the climactic introduction of Smaug, the plot returns to mildly comedic action sequences, with the addition of a love triangle that ensnares the film’s sole female character, the elf warrior Tauriel, and weakens her otherwise strong moral base and independence with the motive of forbidden love. Though the climactic meeting of Bilbo and Smaug offers great performances by both Martin Freeman and Benedict Cumberbatch, respectively, the moment is ruined by an overdramatic fight sequence that includes the most ludicrous and over-the-top use of gold in recent memory. Smaug the Fabulous shall be remembered in infamy. Admittedly, the near-constant action and impressive visual effects do make the just-under-three-hour movie seem shorter, but it also produces a movie that feels flat and empty, with too much whimsy and fight scenes too impractical for the gravitas of the quest to ever break through. This entry was posted on January 8, 2014 by Cameron in Movie and tagged adaptation, Bilbo Baggins, Desolation of Smaug, movie review, reaction, Smaug, The Hobbit.